During the Arena Opera Festival, we offer our "Verona Arena - Lake Garda" bus service. This evening connection is aimed specifically at tourists staying on Lake Garda, providing them the opportunity of watching the shows in the Arena and then return in comfort to their holiday resorts on Lake Garda. 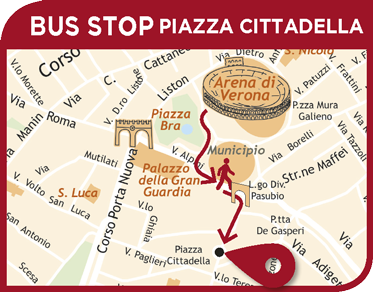 To get to the Arena, you can use any one of the many bus lines that link Lake Garda with Verona (lines 163-164-185). Opera Bus Service leaves 30 minutes after the end of the show and reaches Castelnuovo del Garda, Peschiera, Lazise, Bardolino, Garda, Torri del Benaco, Brenzone and Malcesine. The bus starts from the bus stop in PIAZZA CITTADELLA. To get to Verona you can use one of the many bus lines coming from Lake Garda. Garda bus station - from Monday to Saturday 7.45 a.m. - 1.45 p.m.
Verona Porta Nuova bus station - from Monday to Saturday, 6.30 a.m. to 7.00 p.m.
Piazza Renato Simoni - from Monday to Friday 8.00 a.m. - 1.30 p.m., 2.30 p.m. - 5.30 p.m.; Saturday 8.00 a.m - 1.15 p.m.